Exclusively working for Missionaries and non-profit development workers already since 1970! Christian identity and knowledge of the Mission work and projects, which gives us solid information and understanding on your needs for travel in general. SIAMA saves you time and effort in browsing many websites for the cheapest fare. We help you to find the best and cheapest way for your trip. SIAMA will always search for the cheapest possibilities, whether Missionary or restricted tickets, whereas online ticket providers provide tickets with strict conditions only. Especially for one way trips and complicated routings SIAMA can offer you great deals! Flexible conditions on Missionary fares with higher baggage allowance and possibility to change dates after tickets are issued at no or minimal charges, low cancellation fees and air tickets with a maximum validity of one year. Every member receives free SIAMA Bonus points which can be used for reduction in fares or for a gift to your Mission/project. SIAMA is in easy reach by phone, email or skype and will always reply within one working day. 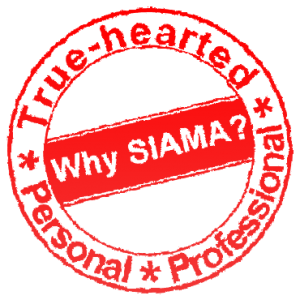 SIAMA is a Society and operates non profit. Extra commissions of airlines will be used to the benefit of the SIAMA members. No hidden charges. We always quote you the full prices inclusive of any taxes and no reservation fees. By booking through SIAMA together as missionary partners we can achieve better fares and conditions for Missionaries worldwide. True committed and competent experienced staf who do their utmost to assist you for whatever you need, they give you true-hearted, personal and professional advice. Give us a chance and we will surprise you!